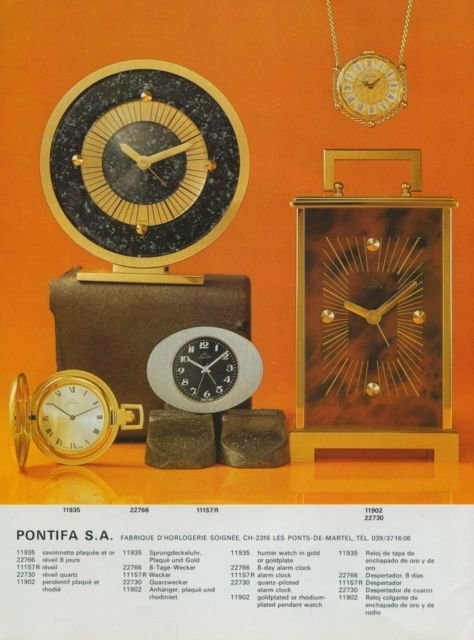 Originalfull-pageSwiss magazine advertisement from the year 1977 for Pontifa Clock Company, Pontifa S.A., Switzerland. The advertisement was carefully removed from a Swiss magazine. [Please note: this is a paper magazine advertisement only; no watch,clock, parts or tools are included. ]Thepage measures approximately75/8 inches wide by 10 1/4inches high (including margins, if any).As with most vintage ads, theremay besome yellowing to the paper due to ageas well as the possibility ofsome light bends from handlingand light wear, edge/cornerwear, or ink transfer. (Any significant damage or wear will benoted. Light wear and imperfections are to be expected. )[The image shown isof the actual ad offered for sale. ]The advertisement was carefully removed directly from a magazine. [Please note: this is a paper magazine advertisement only; no watch, clock, parts or tools are included. ]Powered by eCRATER . List your items fast and easy and manage your active items.